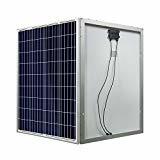 Basic component for off-grid solar panel system, caravan, RV, boat, green house solar panel system. Perfect for 12-volt battery charging or multiple panels can be wired in series for 24/48-volt battery charging or for grid-tied applications. Easy Installation with pre-drilled hole, each solar panel comes with 90cm 12awg cable with MC4 Male/Female quick connectors. Size: 996*665*35 mm, Boxed-product Weight: 8.6 Kg.